A Sangeet is a ceremony held before the wedding where the family of the bride-to-be & the groom come together for a night of dance, music and fun. Traditional songs are sung and dances are performed on Bollywood tunes. Many at times the Mehendi ceremony is often combined with Sangeet. For this fun evening, ‘Borrow it Bindaas’ listed out few tips which can help you to enjoy your night out! If you are going to be dancing the night away on the Sangeet ceremony, you will have to make sure that the outfit that you select is comfortable. You can opt for Salwar-Kameez, Kurta-Churidhar or Lehenga which are easy to carry off plus go less on the heels. The Higher the heel, the more difficult it will be for you to enjoy the whole night. Opt for either wedge heels, kitten heels, or even flats or juttis. Sangeet ceremonies are the best time to experiment with your look. An unusual color, Sharara, Patiala salwars are few examples which a lady can wear for a Sangeet ceremony. Another trend that is catching on in India is to wear jewelry made of real fragrant flowers like jasmine, rose petals or marigold. Guys can opt for traditional waist coat on top of a kurta or dhoti pants with a bandhgala jacket. If you are attending the sangeet, they can try out contemporary looks like printed lehenga with a choli & dupatta also work well. Sangeet ceremony is all about having fun so theme inspired dressing works well for this event. Mughal Era, Punjabi Bhangra, Vintage Bollywood, Indian Royals are few inspirations which you can keep in mind while selecting your ensemble. 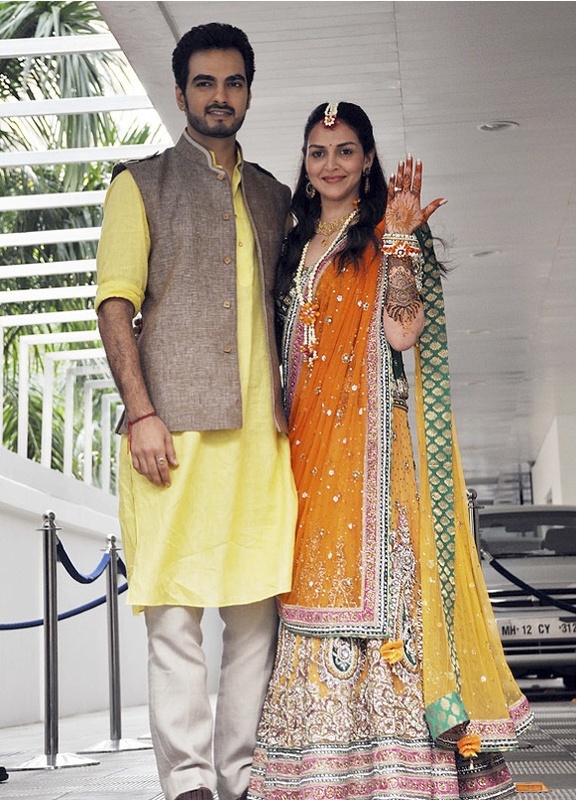 Actor Imran Khan and his wife Avantika wore royalty inspired ensembles for their sangeet .